Founded in 1963, Royal Jordanian is the national airline of Jordan. North America. 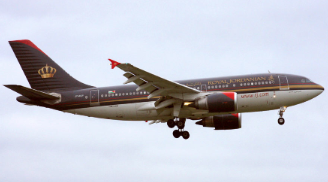 In 2007, Royal Jordanian was partially privatised, a rarity in the Middle East among flag carriers. The airline became a member of the oneworld alliance, also in 2007 and, until Qatar Airways becomes part of the alliance, is the only Middle East representative. The Arab Bank and Royal Jordanian launched the fist co-branded Visa card in Jordan on June 6, 2005. Chairman of the Board and Chief Executive Officer of the Arab Bank Abdel Hamid Shoman and RJ President and CEO Samer Majali patronized the ceremony held on this occasion, which was attended by a large number of businessmen, Arab Bank customers and RJ passengers. Shoman underlined the Arab Bank's endeavor to offer new services in the banking market. He said that the Arab Bank is keen on rewarding Visa card holders and encouraging the customers to use the Arab Bank cards. This special Visa card comes in partnership with Royal Jordanian, Jordan's national carrier and a leading carrier regionally and internationally. He expressed that the Arab Bank is always eager to run projects together with Royal Jordanian and other national companies. "The co-branded Visa card," said Shoman "which has the same privileges of other Arab Bank credit cards, is to increase the customers' knowledge of Royal Jordanian's frequent flyer program." He added that the Visa card will give its holders several rewards and better introduction to RJ's services and amenities. This co-branded Visa card is a remarkable case of cooperation between two important companies. Majali expressed RJ's satisfaction with the partnership with the Arab Bank, one of the largest Arab banking organizations. He pointed out that this new Visa card boosts the privileges RJ offers passengers through Royal Jordanian's frequent flyer program, Royal Plus. "The frequent flyer program," said Majali "was set up in 1984 and it is under great demand nowadays. The number of members rose from 34,000 in 2003 to the current 65,000 members. Royal Plus offers passengers numerous services and rewards, among which access to RJ business lounges, free allowance for extra baggage, class upgrades and free tickets on Royal Jordanian or other international airlines which are allied with Royal Jordanian through code sharing." He said that the points frequent flyers earn may be exchanged for free nights at some of the five-star hotels in Jordan. This aims at giving the members more alternatives and bolstering internal tourism as well. Majali voiced confidence that the partnership will enhance the Royal Plus program and give passengers enjoyable rewards upon using the Arab Bank-Royal Jordanian Visa card. The co-branded Visa card adds points to the Arab Bank customers who joined RJ's frequent flyer program on every purchase made locally and internationally. When the customer accumulates a certain number of points, he can exchange them with free tickets or discounts on ticket prices and upgrading to Business Class (Crown Class). The Visa card can also be used for money drawing, with the privilege of installments on the card and free insurance against travel accidents. Royal Jordanian and the Arab Bank will grant the first 200 Visa card holders free tickets. At the end of the ceremony, Abdel Hamid Shoman delivered the first co-branded Visa card to the chairman of RJ Board of Directors, Umyya Toukan and Samer Majali.